When My Fair Lady opens July 31, Joe Penrod and Jessie Swiech will once more be sharing a stage. Recently they've appeared as the head of the household and a lady's maid in A Little Night Music for Prairie Fire Theatre, and the head of the household and his daughter in Other Desert Cities for Heartland Theatre. This time out, Penrod will play Henry Higgins, the infamous professor who tries to turn a lowly little flower seller into a fine lady, while Swiech is Eliza Doolittle, the girl who gets caught up in Professor Higgins' makeover plan, in the Lerner and Loewe musical My Fair Lady at Prairie Fire. My Fair Lady ran for six years on Broadway from 1956 to 1962, with a cast that featured Rex Harrison and Julie Andrews when it opened. Higgins' songs include "Why Can't the English?" and "I've Grown Accustomed to Her Face," while Eliza gets "Wouldn't It Be Loverly?" and "I Could Have Danced All Night," as well as the spirited "Just You Wait" where she vents her frustrations with the professor. For Prairie Fire, Todd Wineburner will take on Colonel Pickering, Higgins' friend and partner in the Pygmalion plan, while Rhys Lovell will both direct and play Alfred P. Doolittle, Eliza's dad, who always has his eye on the main chance. Alfred P. is also the one who gets to sing "With a Little Bit of Luck" and "Get Me to the Church on Time," two of the biggest hits from the score. Henry's mother will be played by Carolyn Stucky, with Nancy Nickerson as his long-suffering housekeeper, Mrs. Pearce. Chris Walburt will appear as Eliza's other suitor, sweet Freddy Eynsford-Hill, and he will be supported by Katie Henderson, who plays his mum. 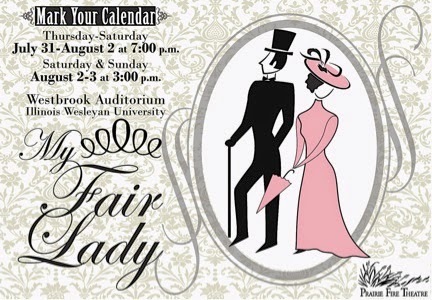 Prairie Fire's My Fair Lady has a good-sized cast, with Ben Ambler, John Bowen, Lyndsay Byers, Bailey Combes, Jeff Courtright, Lauren Guttschow, Kinsey Hamra, Grace Henderson, Amy Humphreys, Rick Jensen, Bob Mangialardi and Claire Stucky in various roles. Performances are scheduled for Illinois Wesleyan University's Westbrook Auditorium from July 31 to August 3, with Thursday, Friday and Saturday curtains at 7 pm and Saturday and Sunday matinees at 3 pm. Those times are a little different from most venues in Bloomington-Normal, so make a note and be sure to get yourself to the theater on time. Ticket prices range from $20 for adults down to $10 for students. Click here for all the details.